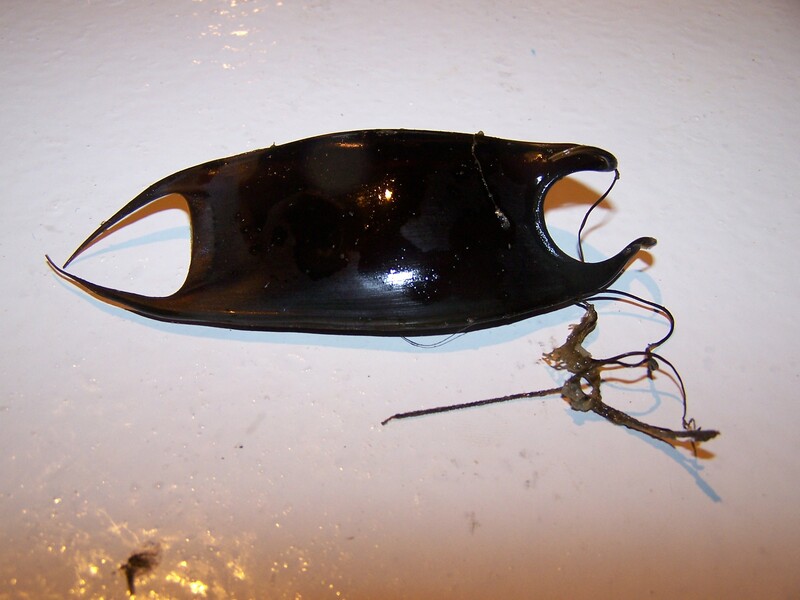 On my last blog I introduced you to five species of shark found so far. I think you can tell which one is my favorite, which is yours? 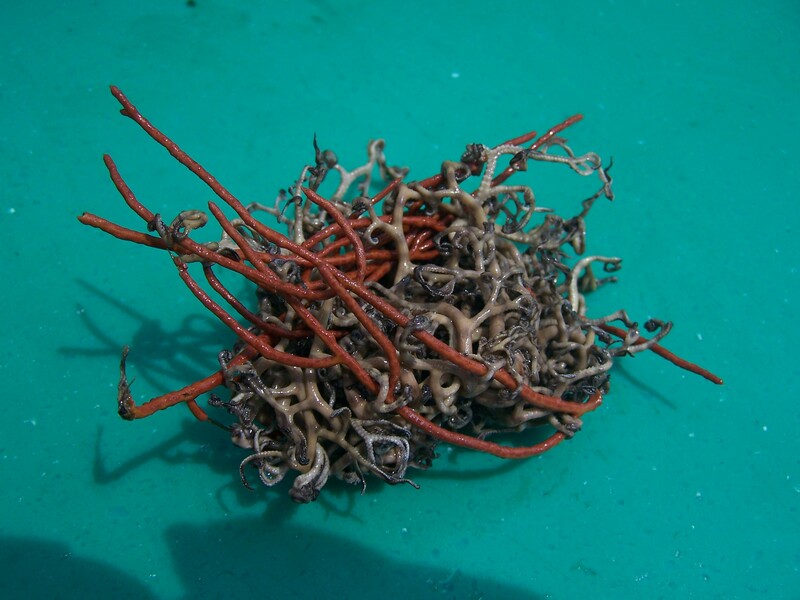 Even though our mission is to collect data on sharks, you never know what might come up on the end of a hook (or tangled in the line!). 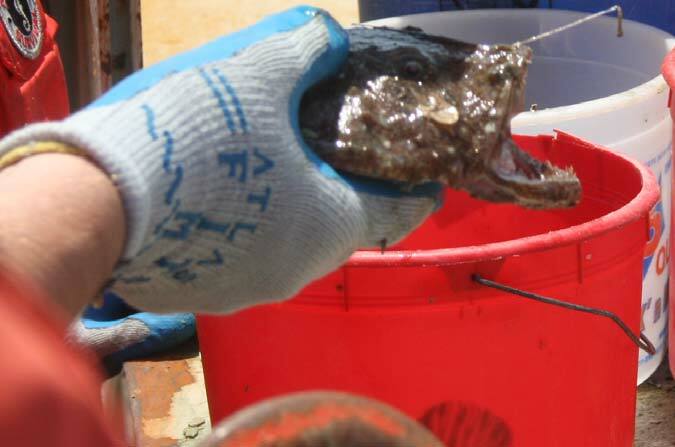 Data is still collected on just about everything else we catch. For today’s blog I have put together a photo journey on the so many other beautiful creatures we have caught. There you have it. 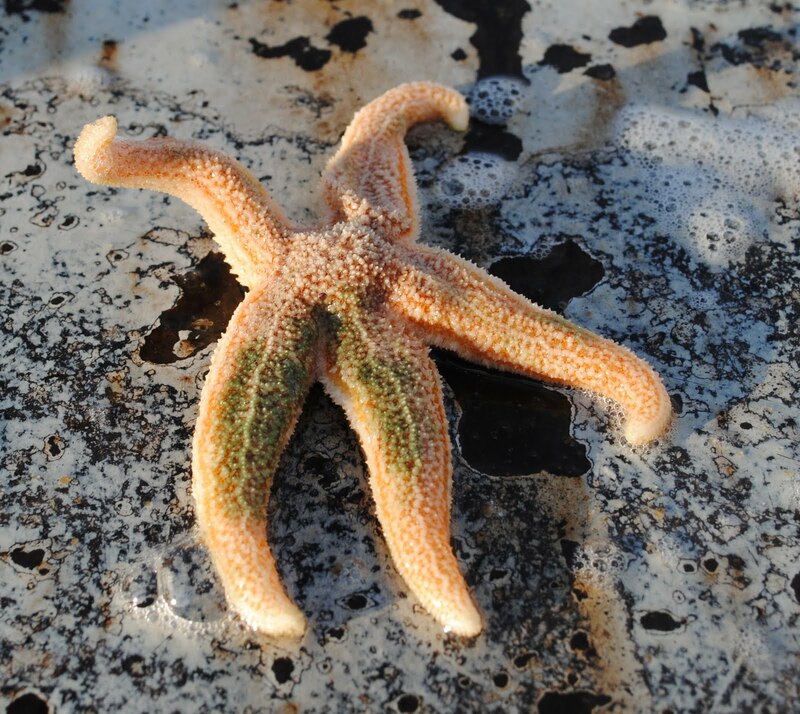 I hope you enjoy the pictures of just some of the beauty and diversity in the Atlantic Ocean. Be sure to visit my next blog when we tie up loose ends! 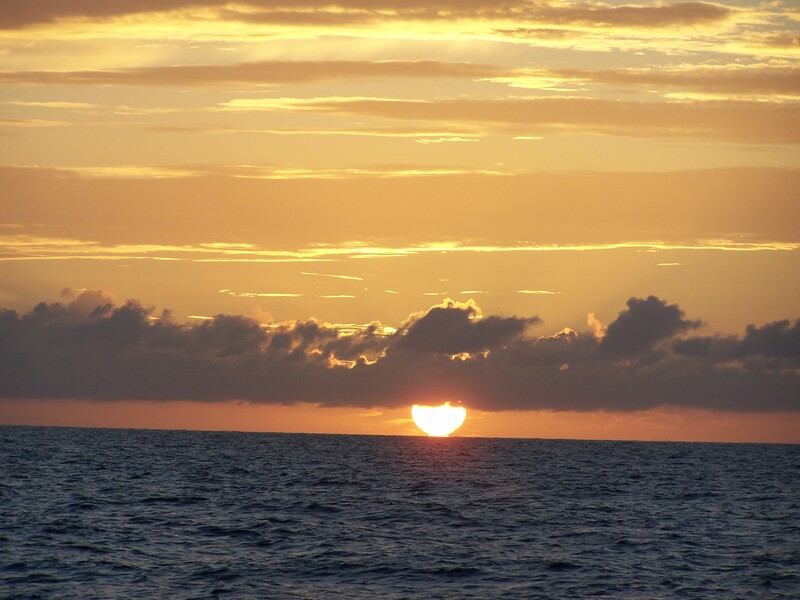 Geographic area of cruise: Subtropical North Atlantic, off the east coast of Florida. During the thirteen days we have been out to sea doing research, we have sent the ROV down both inside and outside of five different MPAs from Florida to North Carolina and back again. This allows the scientists to compare fish populations and densities both inside and outside of the MPAs. Since we left Mayport Naval Station in Jacksonville, Florida, we have been averaging a distance from shore of between 50 and 70 nautical miles. It will be fourteen days until we see land once again. From this distance, the ocean seems to stretch on forever. Gazing at the beautiful blue water, it is easy to forget an entire other world lies beneath us. Not all of the ocean floor is flat, there is a small percentage that does have some elevation and structure. 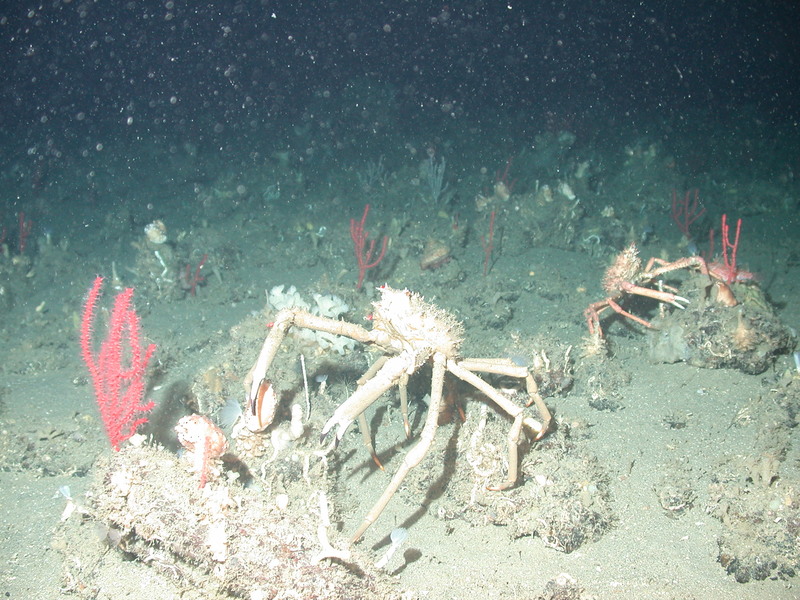 The type of structures on the ocean floor determine what types of species will live there. For this mission, we have mainly been studying areas within the mesophotic zone of the ocean ranging from 40 to 150 meters (130 – 500 feet) below the surface. Temperatures here range from 12 – 23 degrees Celsius (50-70 F). 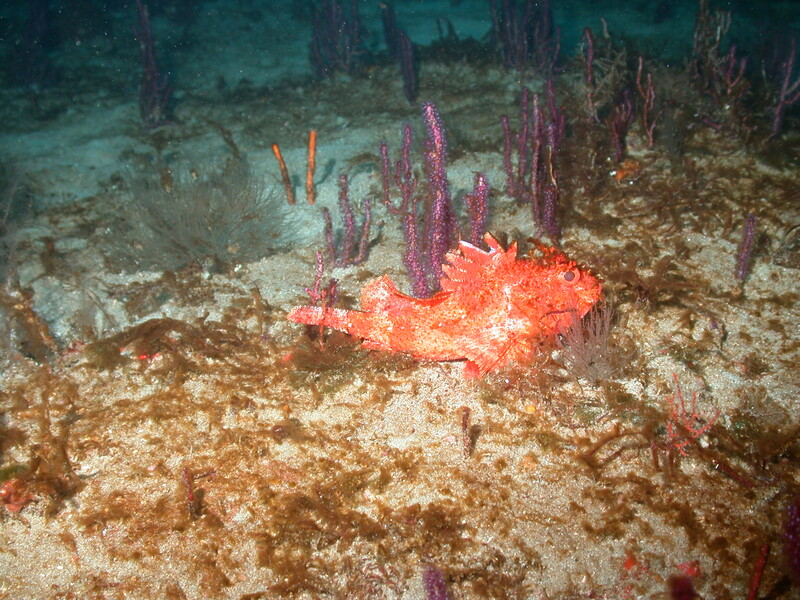 Very little sunlight reaches the mesophotic zone, but zooxanthallae are still able to photosynthesize at this depth. Corals and sponges will also filter feed using the abundant particulate organic matter drifting in the water column they will filter out and eat the plankton. The multibeam images help the scientists determine where to launch the ROV. Areas with a change in elevation tend to indicate that there are rock structures below the surface. It is around these rocks that the majority of fish prefer to live, so these are often the areas at which the scientists chose to collect data. The ridges we have seen range in height from 1 meter to 5 meters. The fish really like areas in the rock that have cracks, crevices and overhangs for them to hide. Many times as the ROV approached the fish, they would scurry into a nearby hiding place. I can’t help but imagine that the ROV with its bright lights and unnatural features must seem like an alien spacecraft to these fish that have never had contact with humans before. 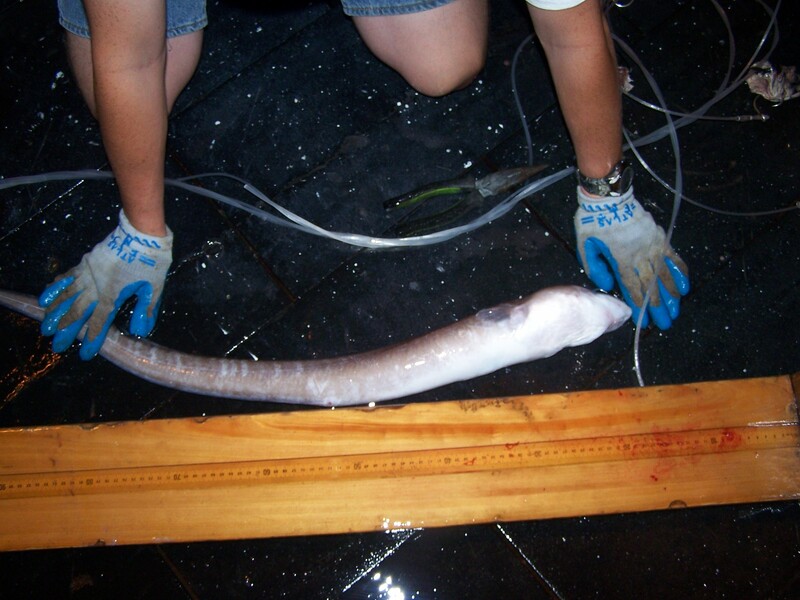 But ROVs aren’t the only thing that these fish need to hide from. I noticed that the larger fish that are toward the top of the food chain were not as skittish as the smaller reef fish. 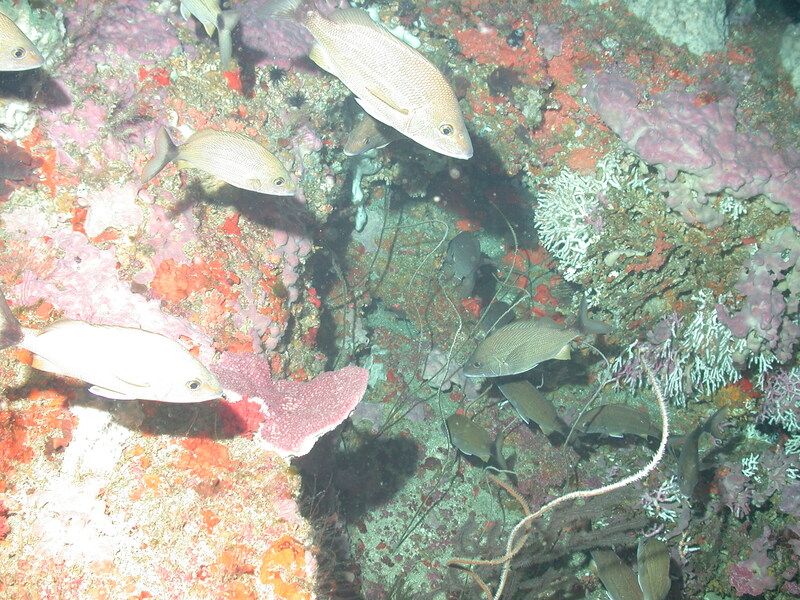 Sometimes amberjacks and scamp would even follow the ROV as if curious about we were doing. And lionfish never budged as the ROV passed unless it happened to be sitting in the ROV’s path. 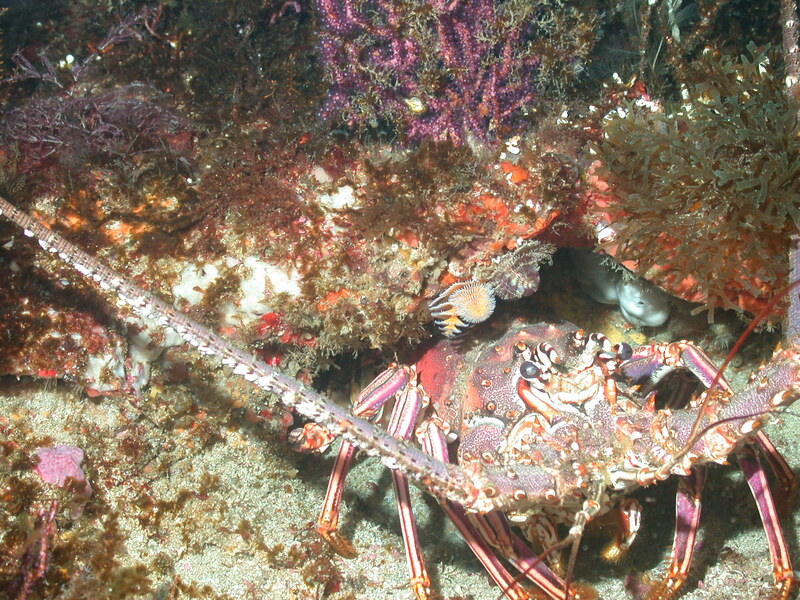 Lobster hiding in rock. Notice how his coloring resembles the reef behind him. 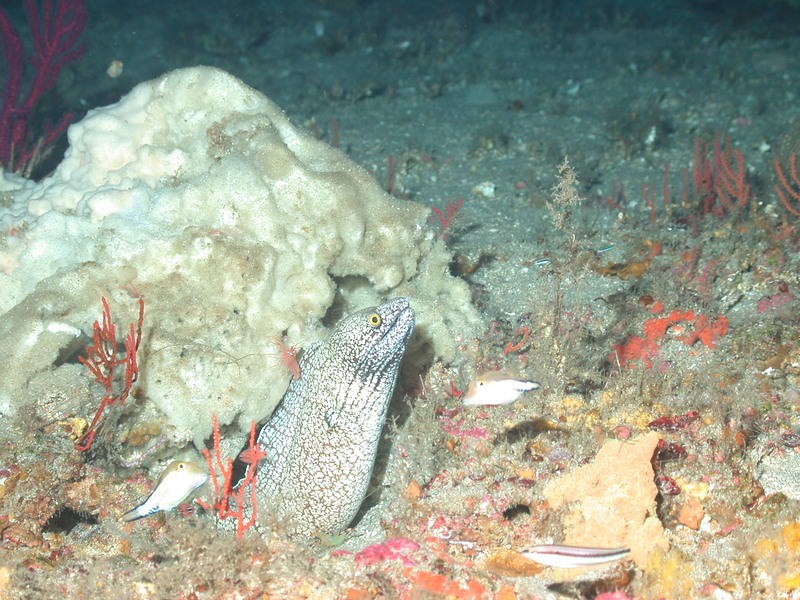 The fish are not the only living things that like these rocky habitats. 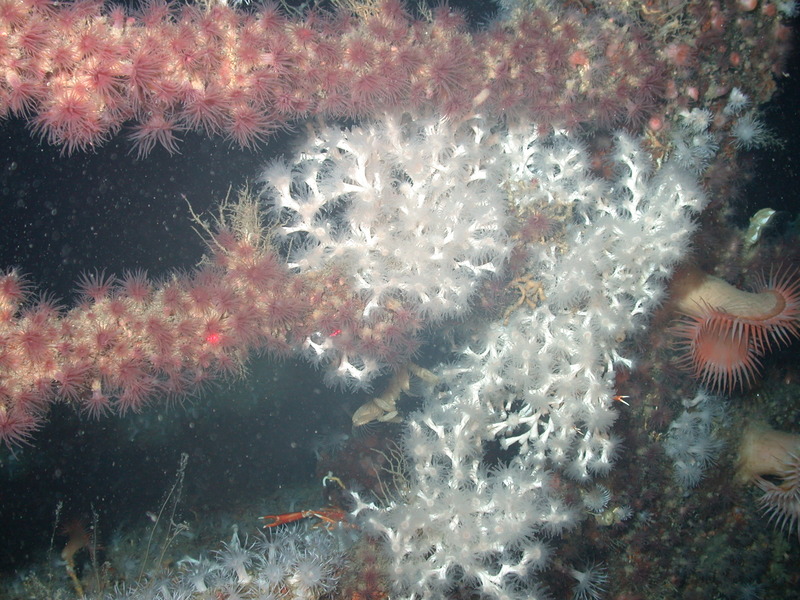 Usually when there are rocky surfaces, we find sponges, corals, hydroids and algae growing on top. 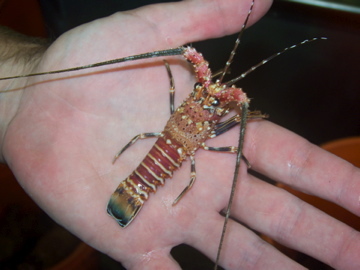 These creatures not only give the reef its beautiful appearance, but they also help to provide habitat as well. 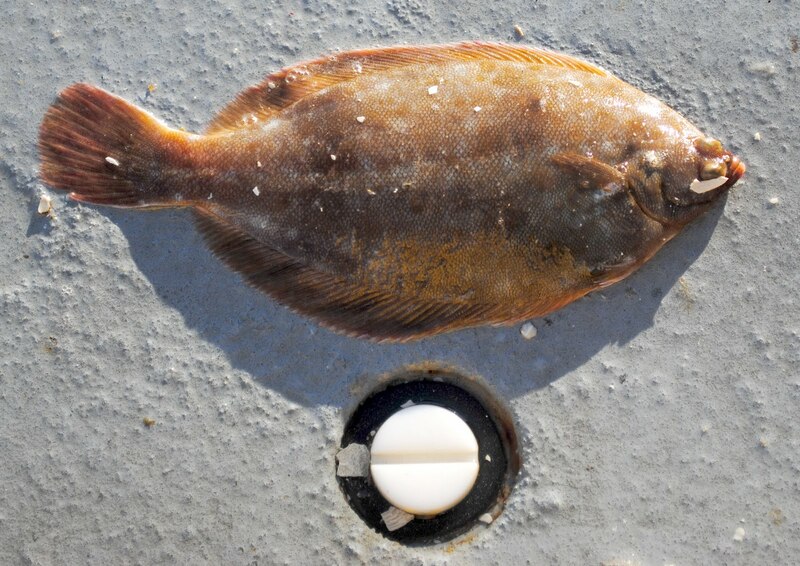 Notice how the flounder blends in with the sand? Sand tilefish make their burrows in the rubble under the sand. 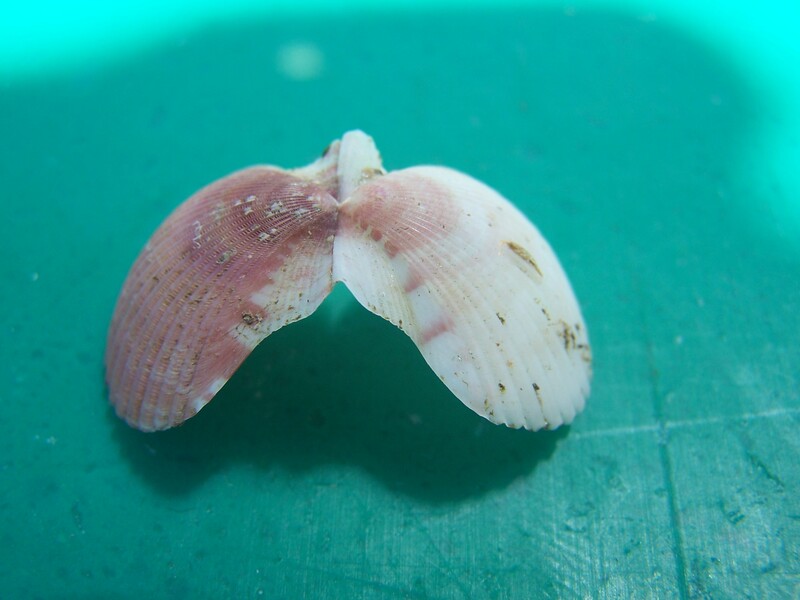 Species that live in the sandy bottom habitat have their own set of adaptations. 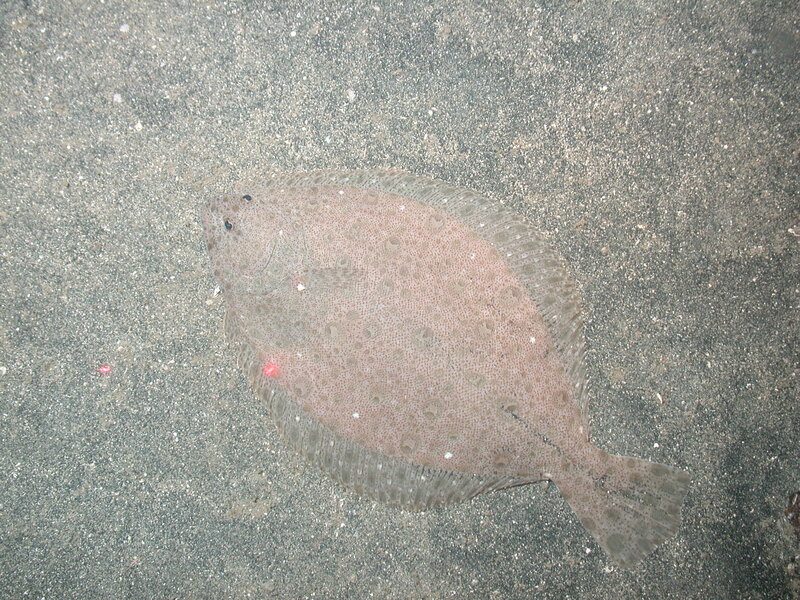 Animals such as the flounder and sea cucumbers have skin colorations that match the speckled appearance of the sand itself. Sand tilefish carve out burrows from the rubble beneath the sand. 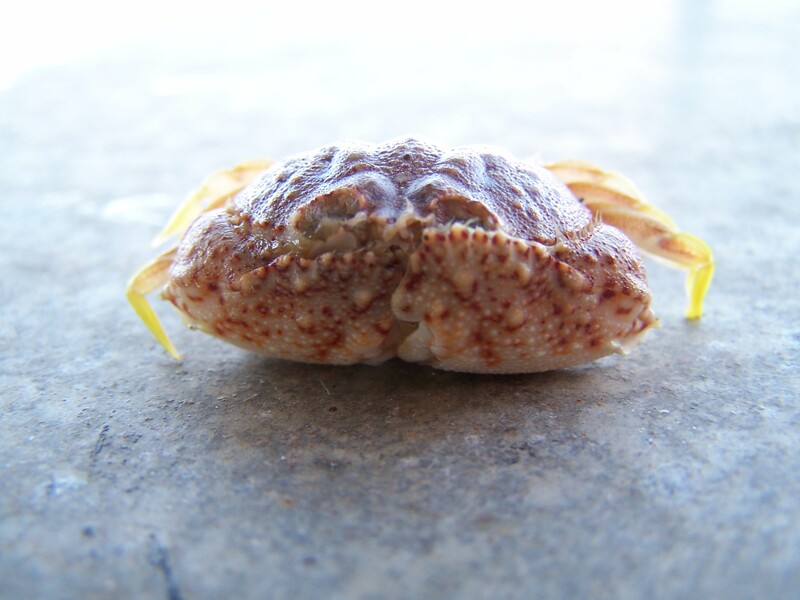 The spider crabs have a carapace that mimics the texture of the rocks it lives near. 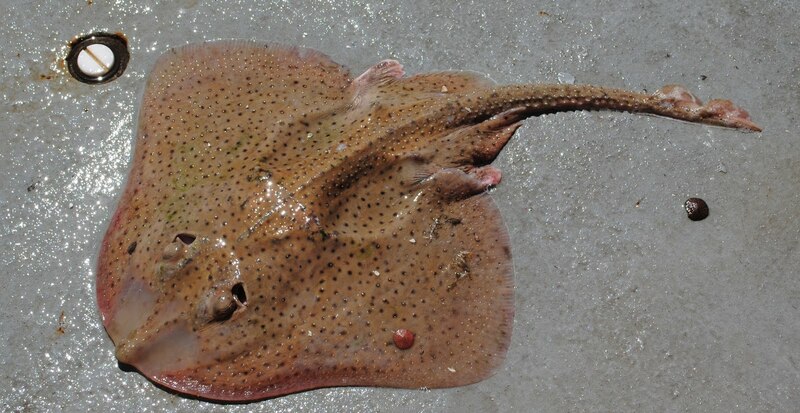 The stingrays, with their low profile, sit on the sandy bottom and use their mouth to scour the sand in search of crabs and clams to eat. Artificial habitats are also full of life. At the shipwreck we visited, not only did we see fish living here, we also saw anemone, tube worms, Venus flytrap anemone, hermit crabs, eels, Lophelia coral to name a few. Other man-made habitats can help rebuild coral reefs. 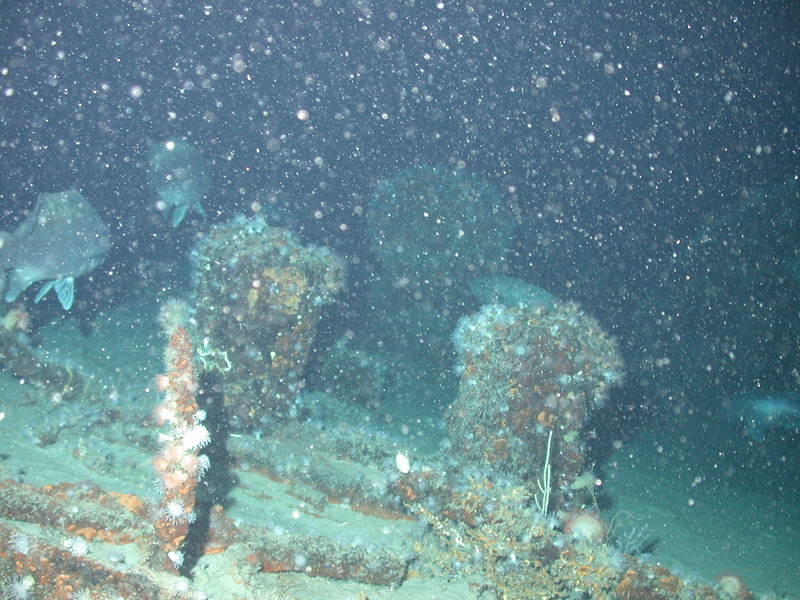 John Reed has placed reef balls on the Occulina Reef in an effort to rebuild the original reef damaged by bottom trawling. These reef balls provide a structure for the corals to anchor themselves to and give the fish places to hide. Even oil platforms can be considered as an artificial reef structure giving a wide variety of species a sturdy structure to call home. 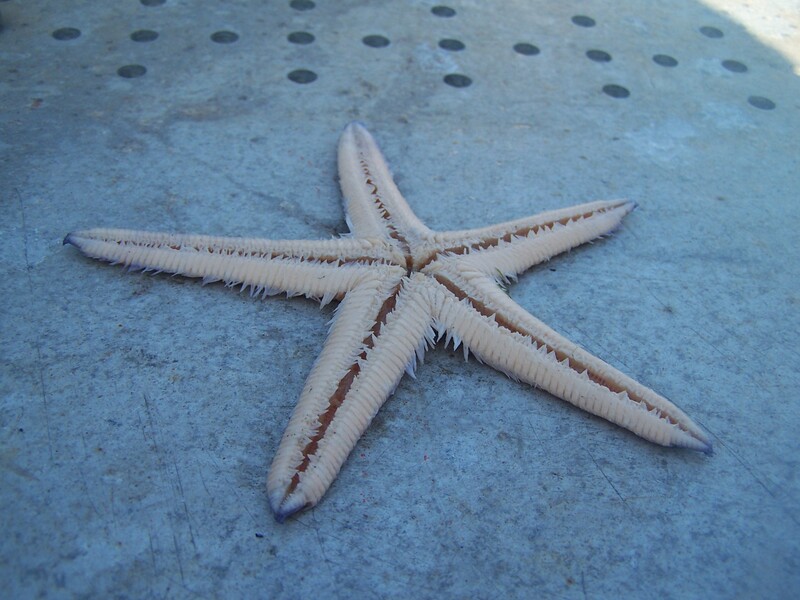 While aboard the Pisces I have learned to identify well over 100 different species of fish and invertebrates. Andy and Stacey quiz me as we are watching the live footage, and I think I finally can tell the difference between a reef butterfly and a bank butterfly. John frequently hands me a text book and challenges me to look up the species we see on the ROV live feed. I am extremely appreciative of everyone being so helpful and sharing their knowledge with me. Each of the scientists have taken the time to answer all of the question that I have. 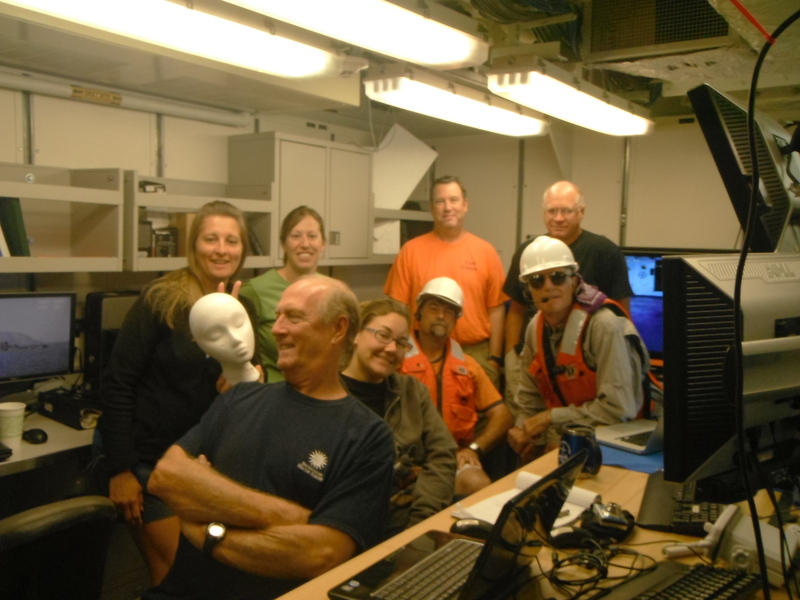 The crew of the Pisces has also been wonderful to work with. Everyone has done their best to make me feel at home. This has been such an amazing experience, I am excited to bring it all back to the classroom this fall! I will never forget my time on the Pisces. 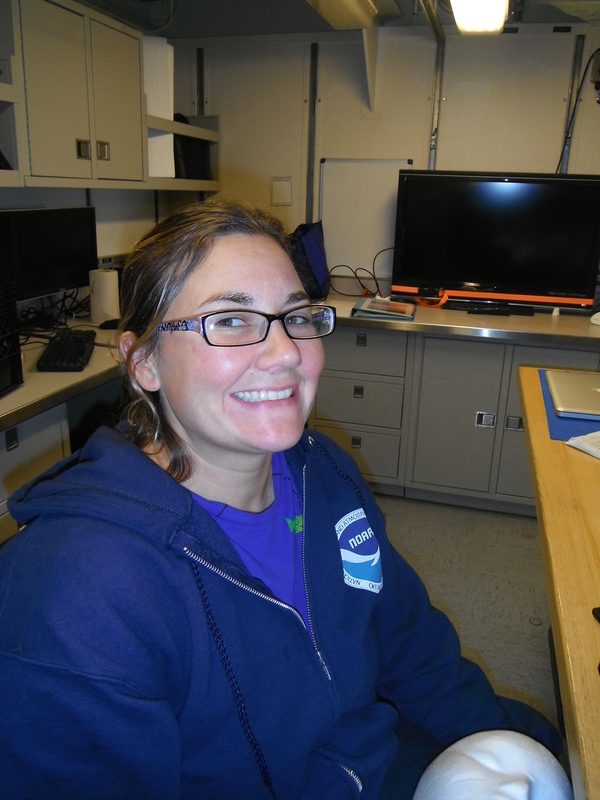 In this section, I will be interviewing scientists and crew members to give my students ideas for careers they may find interesting and might want to pursue someday. Today I interviewed John Reed and Stephanie Farrington. Mr. Reed, What is your job title? 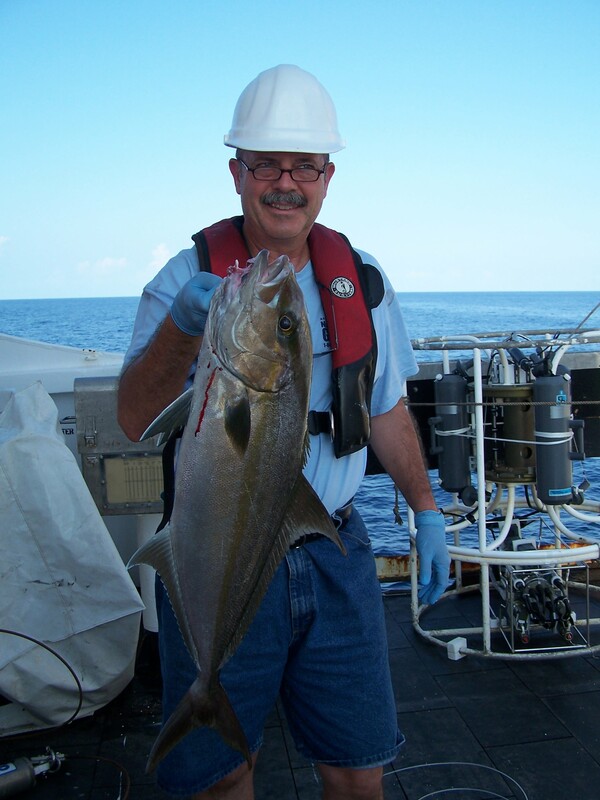 I am the Research Professor in the Robertson Coral Reef and Research Program at Harbor Branch Oceanographic Institute (HBOI) at Florida Atlantic University (FAU). Why did you decide to become a marine biologist? I always knew that I wanted a career where I could do my work outside. My biggest influence came when I was around 13 – 14 years old, I remember watching “The Undersea World of Jacques Cousteau” every Sunday night with my family and thinking that’s what I want to do! What type of responsibilities do you have with this job? Currently I am studying deep coral reefs as part of the Robertson Coral Reef and Research Program and several NOAA grants. My focus is primarily off the Florida coast and up through the Carolinas. 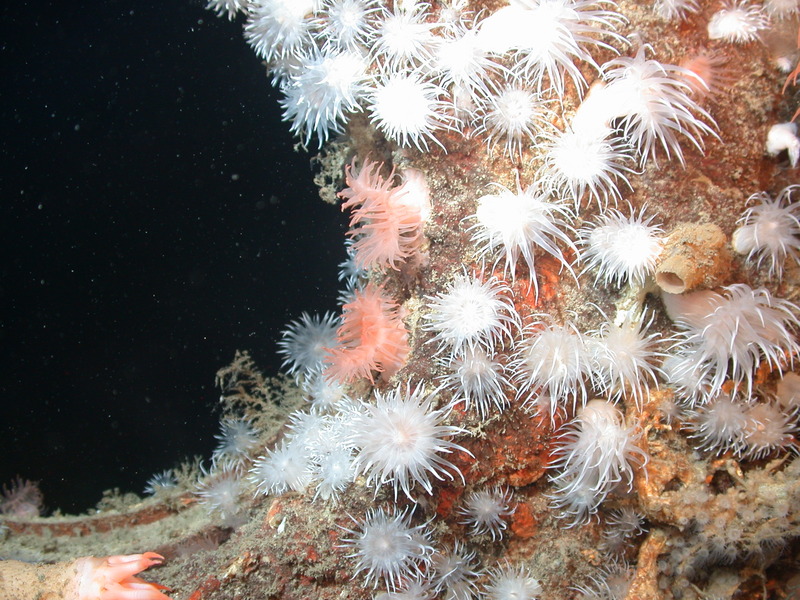 My objective is to protect and conserve deep sea coral ecosystems. 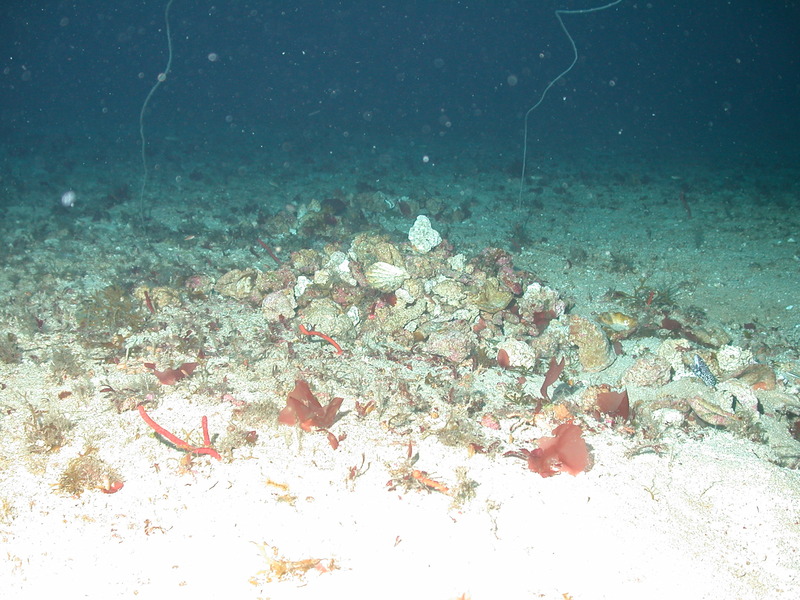 Around Florida alone, our group has discovered over 400 individual deep coral mounds some over 300 ft tall. We have calculated that the area of these deep water reefs may exceed that of all the shallow water reefs in the United States combined. These reefs habitats are incredibly diverse with hundreds of different species of bivalves, crustaceans and fish just to name a few. Deep water hard corals grow very slowly, only about half an inch per year, core sampling has dated deep coral mounds at over 1,000,000 years old. It is vital that we protect these deep reefs from destructive fishing methods such as bottom trawling or energy projects. 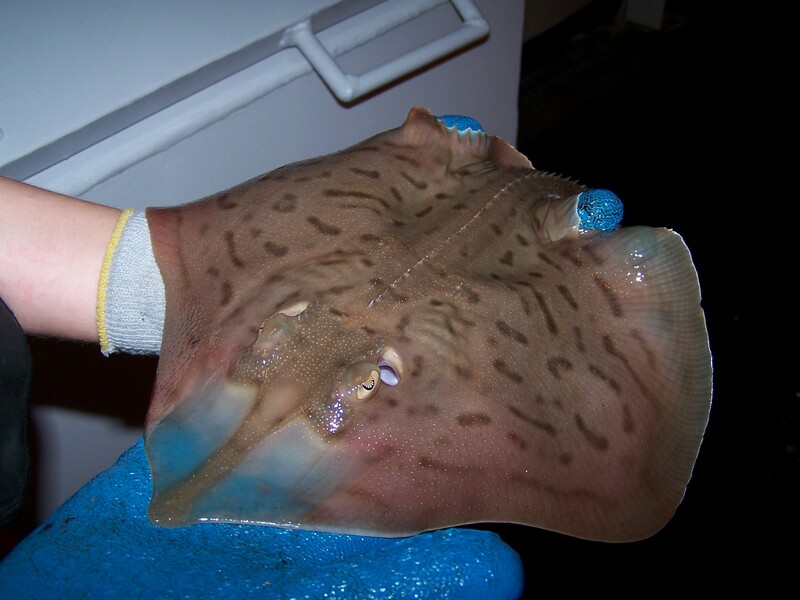 I also manage the archives for the biomedical marine division at Harbor Branch where we have over 35,000 deep and shallow marine specimens from around the world. 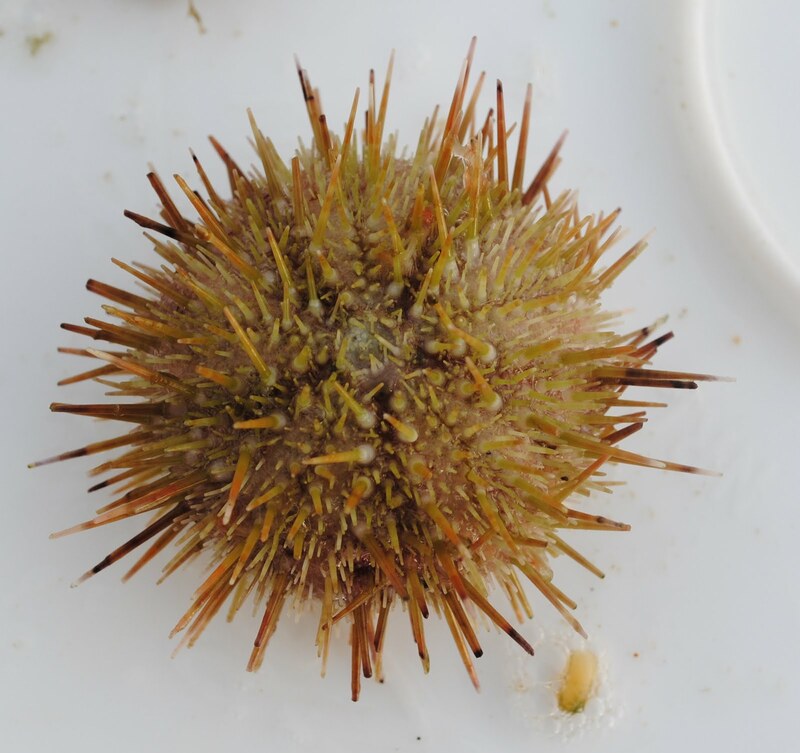 Each specimen has video footage of it in its natural habitat (in situ from the Johnson-Sea-Link submersible), still photos, museum samples as well as several smaller samples for our biomedical research. 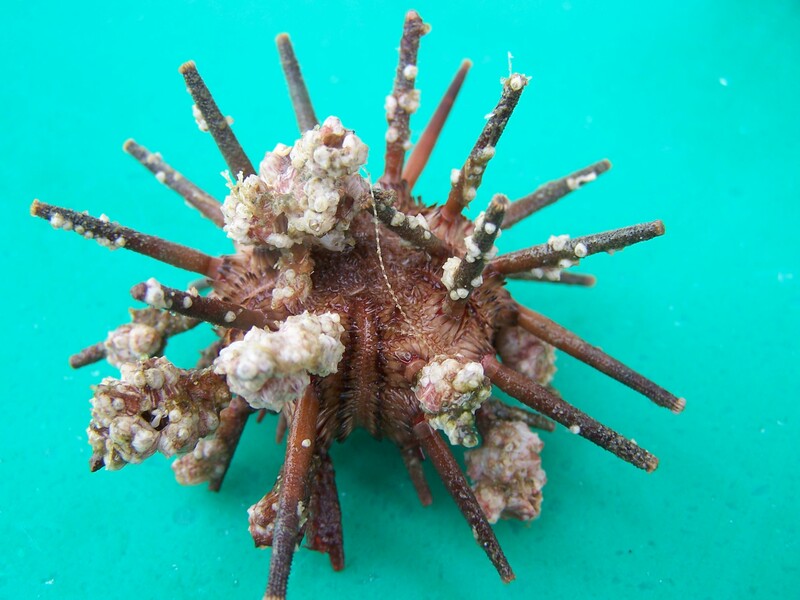 We have discovered novel compounds from some of these marine organisms which may be future cures for cancer or other diseases. Currently our chemists and biologists are working on the chemical compounds that we discovered in a deep water sponge that grows off Florida. In the lab it is potent against pancreatic cancer which is a very deadly disease. What type of education did you need to get this job? I earned my Bachelors Degree in chemistry and biology from University of Miami and my Masters Degree in marine ecology from Florida Atlantic University. My Masters Thesis was on The Animal-Sediment Relationship s of Shallow Water Lagoons and took me four years to study and wrote. While working on my thesis, the Smithsonian had a branch at HBOI, so I would ask the scientists there for help in identifying the animals in my study. Working with these scientists helped me make the connections that eventually get my job with HBOI. What types of experiences have you had with this job? 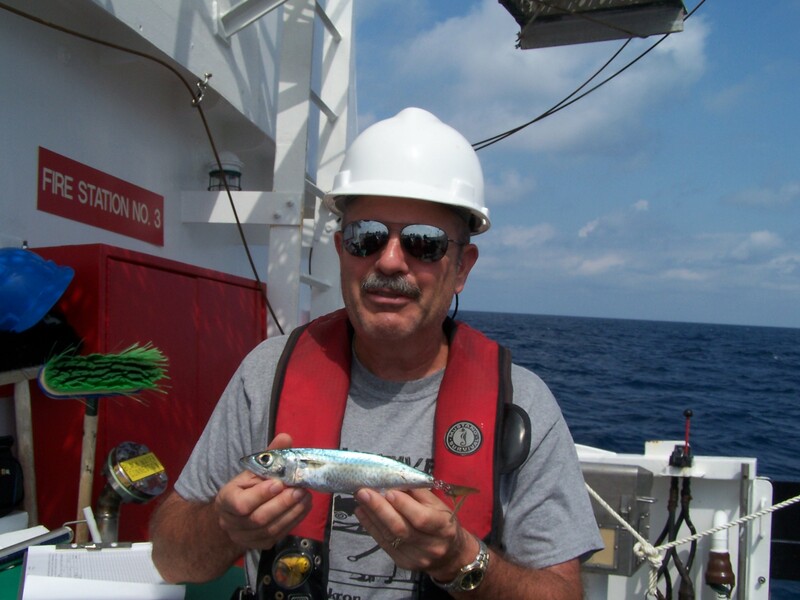 I have been fortunate enough to travel the world visiting over 60 countries and collecting thousands of marine samples for biomedical research at HBOI. I have been able to dive in the Johns0n-Sea-Link submersible to depths of 3000 ft and scuba dive to 300 ft. My research on the deep water Oculina coral reefs off the east coast of Florida allowed me to use our submersibles as well as lock-out diving to study the growth rate and fauna associated with these deep water coral. It is very humbling that my research on these reefs helped to establish the Oculina Marine Protected Area which was the first marine protected area in the world to protect deep sea corals, and more recently the 24,000 sq. 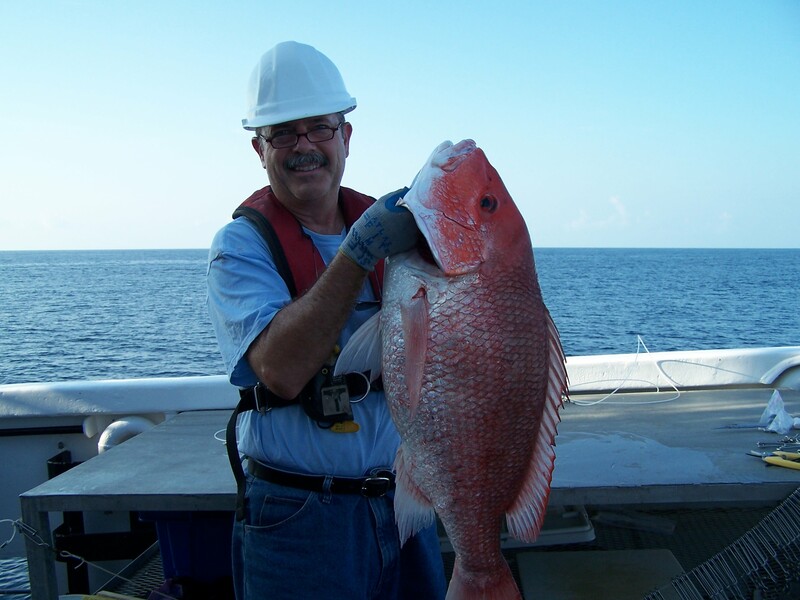 mile deep sea coral habitat area of particular concern off the southeastern U.S.
What advice do you have for students wanting a career in marine biology? 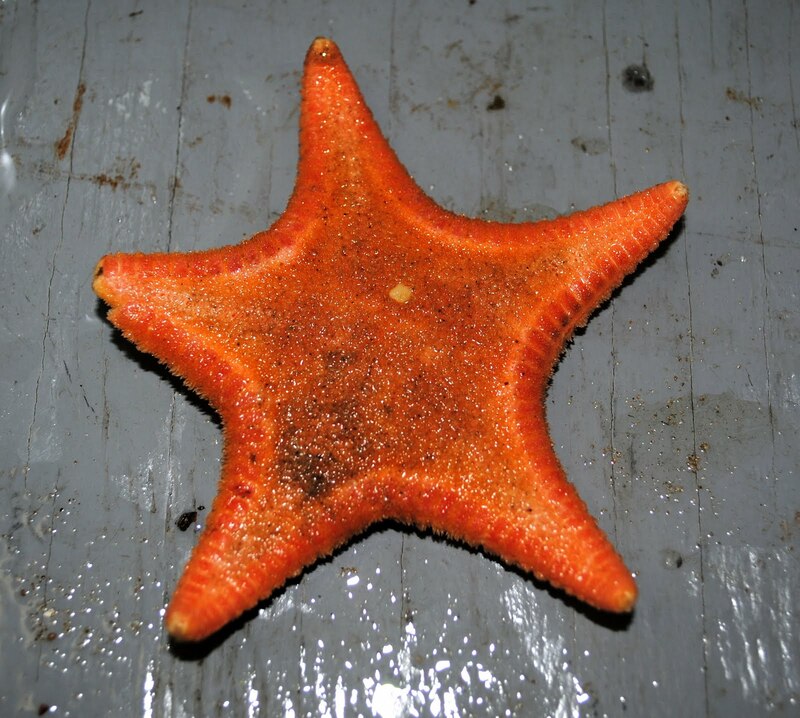 Even if people tell you there are no jobs in marine biology, find a way to do it! Follow what you are passionate about. Get experiences as an undergrad, do internships, build your resume. Make the effort! Do things that are going to set you above everyone else. When looking at graduate school, compare the course offerings of several universities. Research the Principal Investigators (PIs) at those same schools and make contact with them. Get a position as a Teaching Assistant or Lab Aide to build on your resume. All of these things will help you to get the job you want once you graduate. Ms. Farrington, What is your job title? 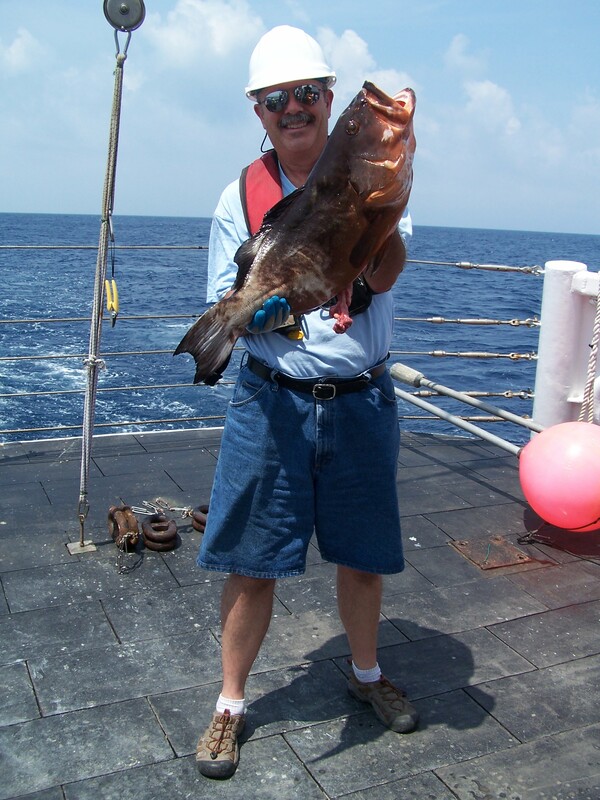 I am a biological scientist for John Reed at Harbor Branch Oceanographic Institute. What type of responsibilities do you have with this job? 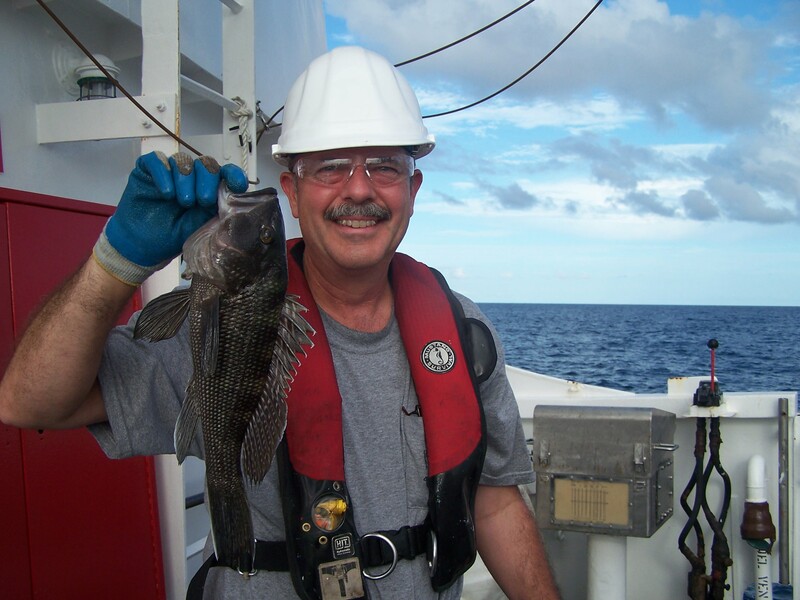 I accompany John on his research expeditions and help collect data. When we return to HBOI, I analyze the data and program everything into GIS maps to give us a visual layout of the different habitats we saw and the species that live there. What type of education did you need to get this job? I earned my Bachelors Degree in biology and marine science from the University of Tampa. 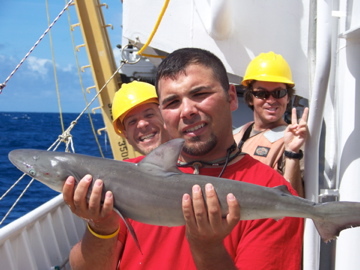 My Masters Degree is in marine biology from the NOVA Southeastern University Oceanographic Center. 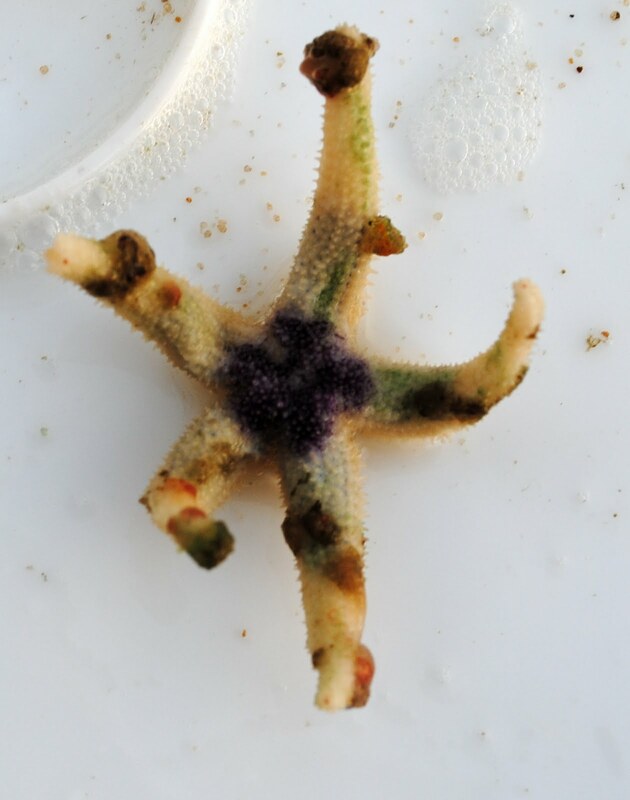 My thesis was on the Biogeography of the Straights of Florida which gave me a solid background in the marine invertebrates of our region. This is one of the reasons John hired me to work with him. What types of experiences have you had with this job? I have been fortunate to travel in our Johnson-Sea-Link submersible six times, twice sitting up front in the bubble, one dive went down to 1700 feet below the surface. I have also been on 8 research cruises since I started at HBOI two years ago. 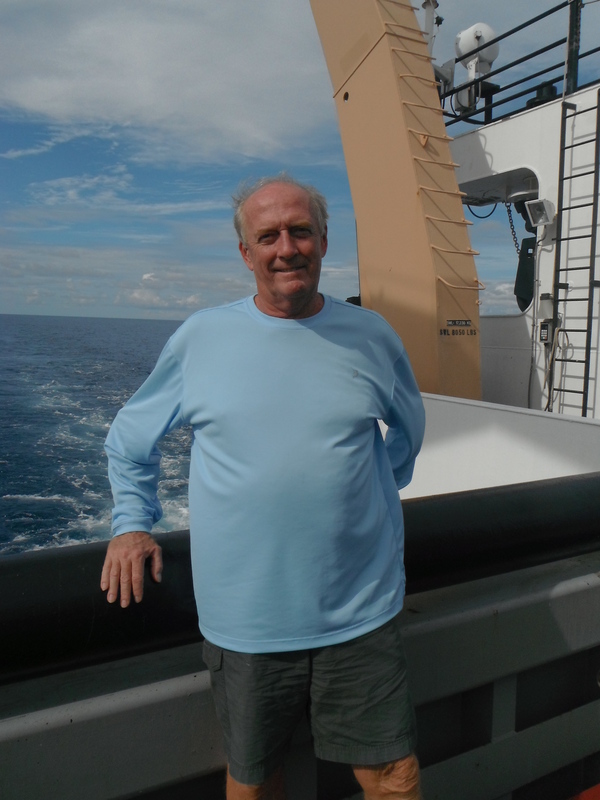 I also had the opportunity to sail on the Okeanos Explorer for three weeks. 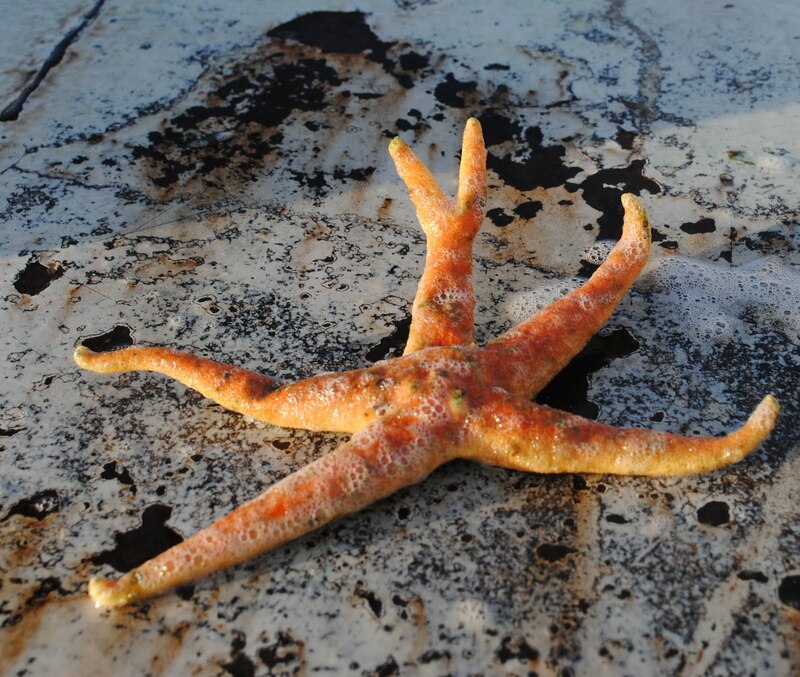 What advice do you have for students wanting a career in marine biology? 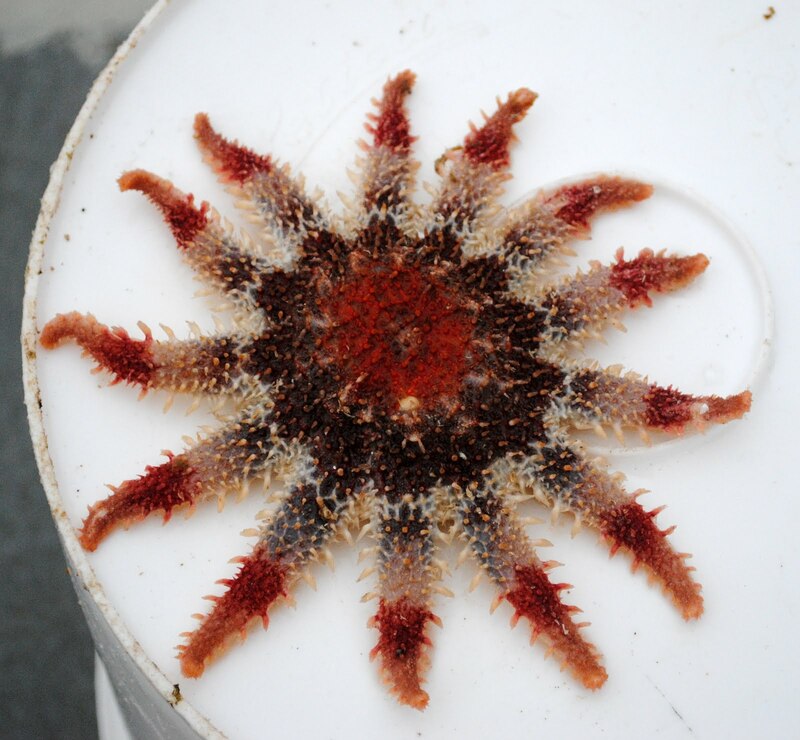 Marine biology is about collecting and analyzing data and doing research and there is so much cooler stuff in the ocean than just dolphins! Cold front moving offshore towards us later today, rain expected. The contents of the dredge are emptied onto the sorting table. The sorting table is full of activity as soon as the dredge is pulled aboard the ship. 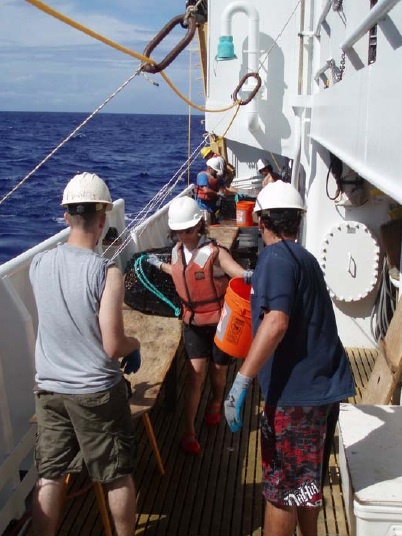 After the crew secure all lines and dump the load the volunteers and scientist begin to sort through the biological that has been brought up from the bottom or the Atlantic Ocean. 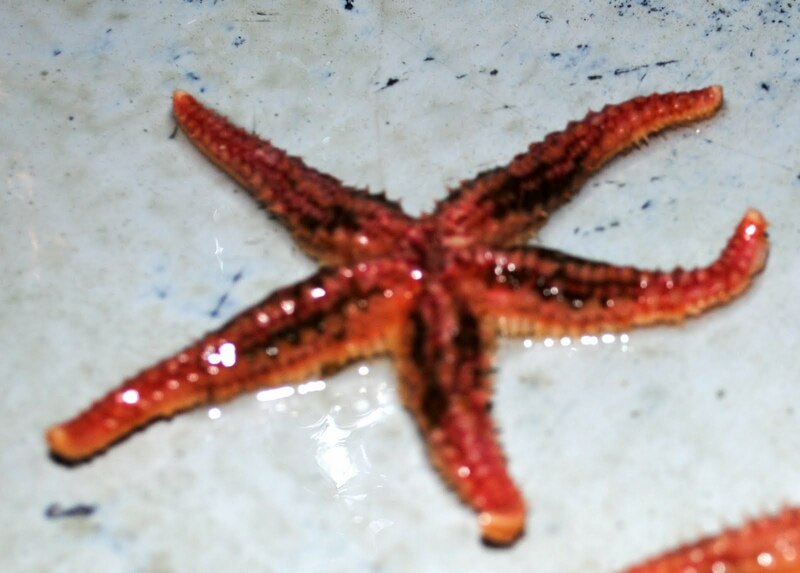 Each dredge can bring a varied amount of sea life on the ship. 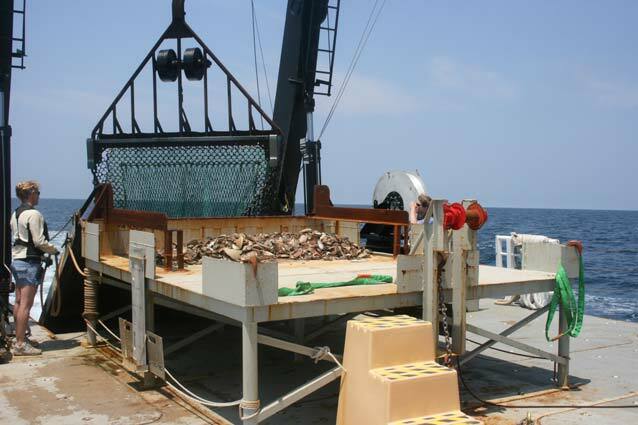 We are always looking for scallop, yet every third dredge we also sort for crabs. All fish are also sorted and counted. 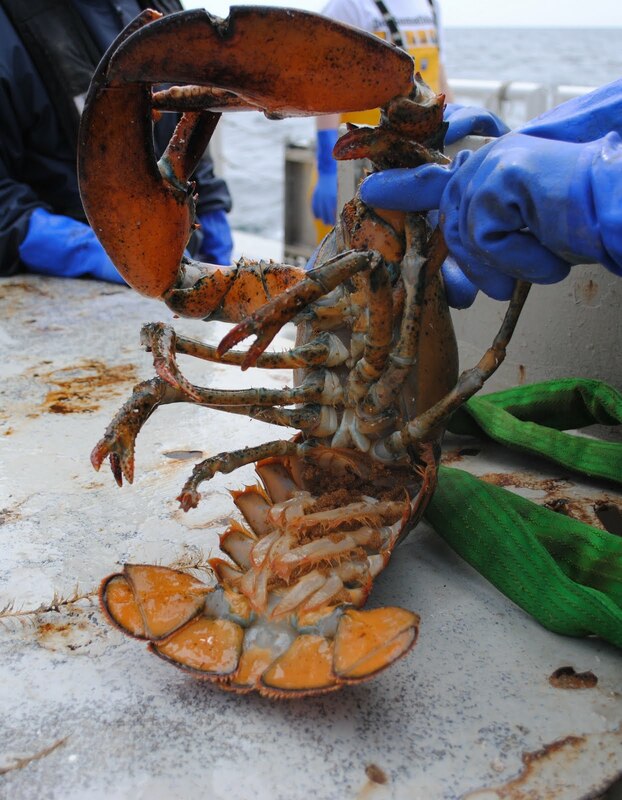 After all the sorting is done the fish, scallops, and crabs are weighed and measured for length. 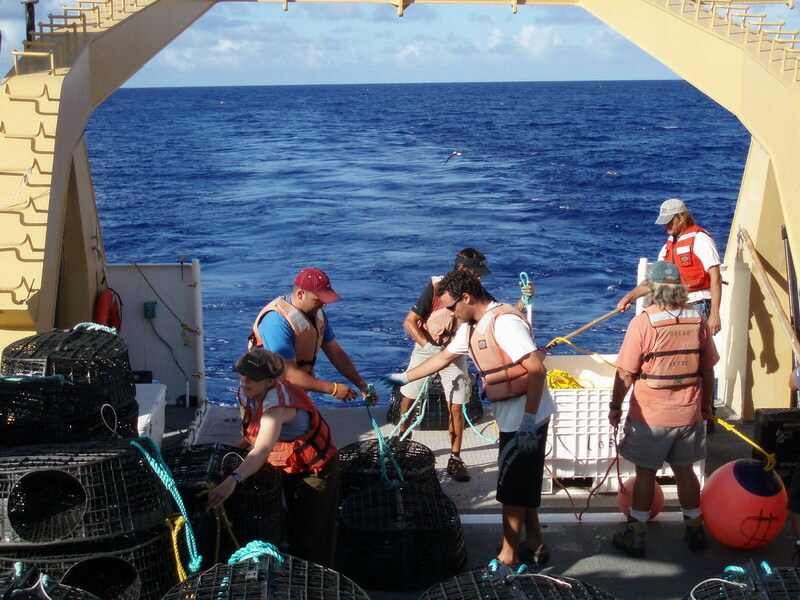 They are then logged into the onboard computer for analysis of results for each catch. We are trawling along closed areas for scallops. These areas have been closed for commercial fishing to ensure that the population has time to recover in that area. 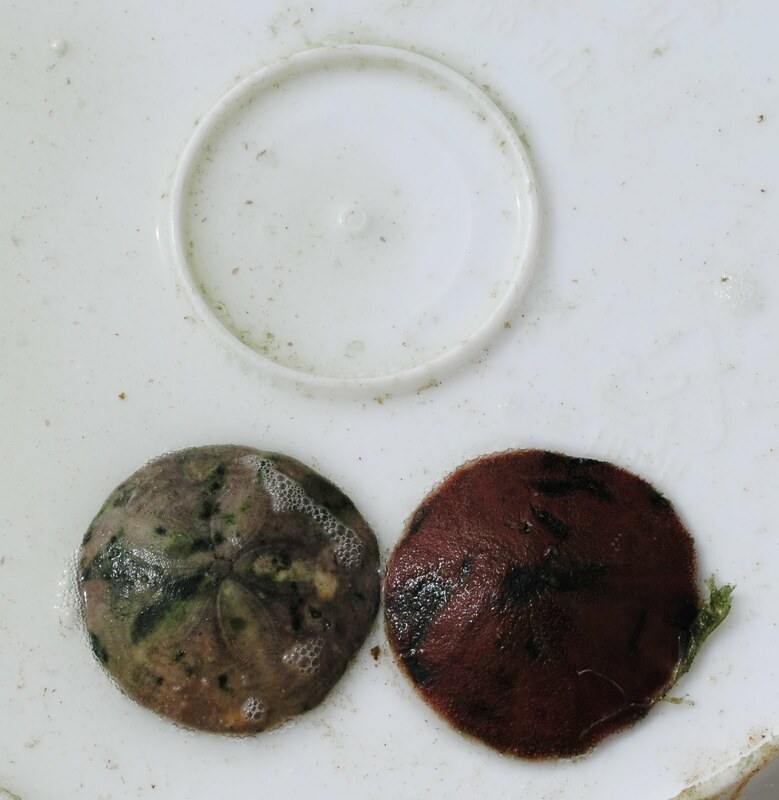 Scallop surveys are carried out by the R/V Hugh R. Sharp, in three phases during the summer. Duane and I are on the second leg, which encompasses the area to the east of Delaware, areas around Long Island, and the area around Martha’s Vineyard south of Cape Cod, Massachusetts. You may find some interesting creatures during sorting. The work aboard the ship can be very long and laborious. The days are long, as each member of the cruise will do a 12-hour shift. My shift is from noon to midnight. The conditions can vary greatly during a shift. During the day the sun may be out with light winds and it gets very warm with all the wet weather gear that is worn during sorting. It is necessary to leave the gear on between dredges, since they occur so often. As soon as the sun goes down the temperatures can drop very rapidly. It is important to keep a hooded sweatshirt and other warm weather gear nearby for the changing conditions. All gear must be taken with you when you leave your cabin so that the other shift can sleep uninterrupted. The days are long, with the goal of all who are onboard to get the science completed in a timely fashion. Keeping a ship stored with goods and running is very expensive so the goal is to get as much science completed in the allotted time as possible. 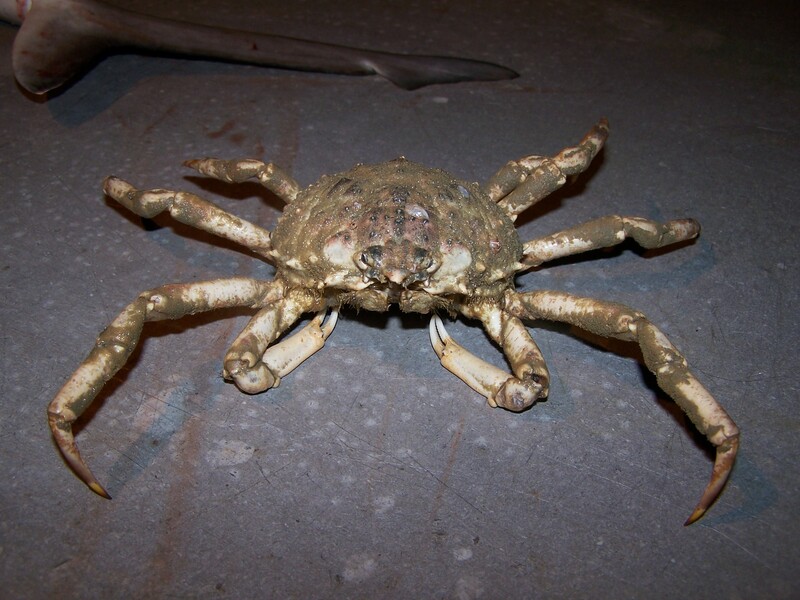 What other bottom dwelling species in the Atlantic are under protection from over-fishing? 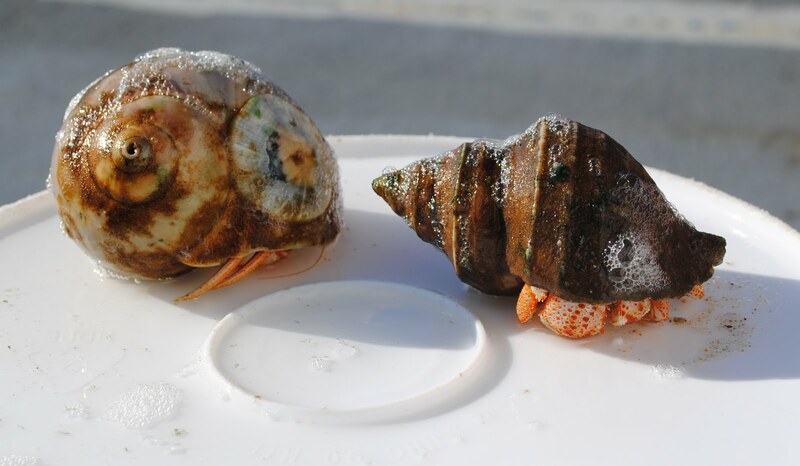 Scallops, eels, crabs, starfish, clams, silver dollars, urchins, goose fish, and many varieties of bottom dwelling fish. 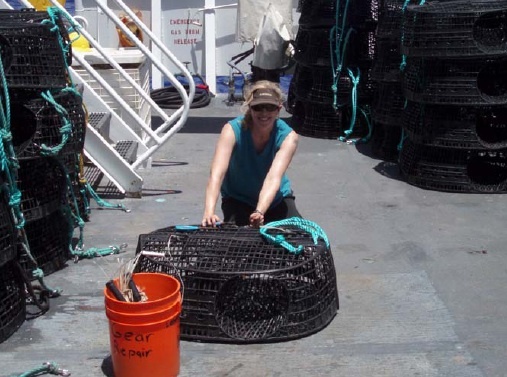 NOAA Teacher at Sea, Maggie Flanagan, repairs a trap aboard NOAA Ship OSCAR ELTON SETTE. We just spent an exciting week setting lobster traps at Maro Reef. Sliced mackerel is our preferred bait, and we scrub the bloody patches that drip to deck every day. 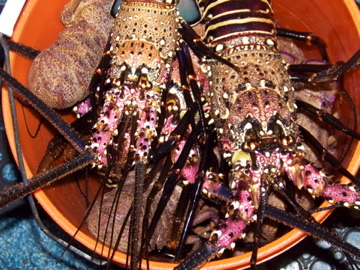 We hauled back many lobsters, as well as eels, crabs, urchins, and fish. 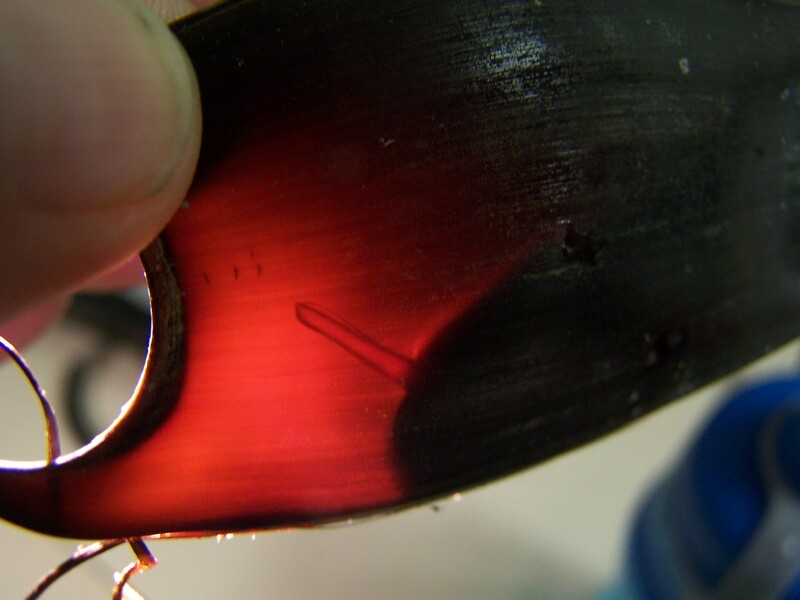 Shark and Octopus can really break up the traps, and ocean conditions can be hard on the gear, so we make repairs as needed. I was proud to put my sailor skills to work helping to splice new bridles on traps. 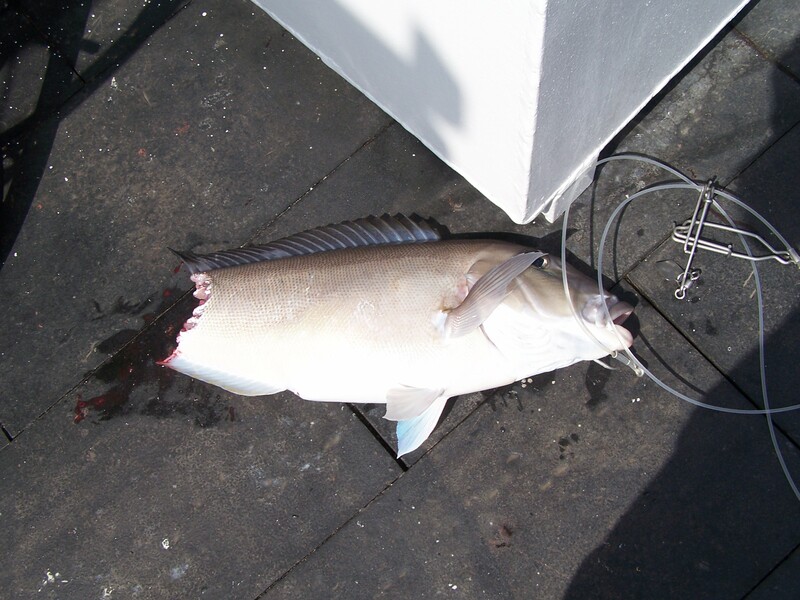 (Splicing is weaving a line back into itself to create a loop, which is used to attach the trap to a fishing line). In the past week our Commanding Officer, Karl F. Mangels, shared a little history on The Marine National Monument area created out of the Northwest Hawaiian Islands. This status is the most protected, but also complex to initiate. The US Fish and Wildlife Service, NOAA, and the State of Hawaii, among others, have targeted this area for preservation for many years. Recently President Bush moved quickly to legalize the Monument status, but it is taking time to work out the details of regulations and procedures, considering the multiple jurisdictions involved. Regulations indicate all activities must be approved by permit, including scientific research, and all ships must have vessel monitoring systems. But, access for native Hawaiian cultural activities is preserved as several of the islands are ancient holy sites. Midway Atoll retains special status and will be open to more public visitation. 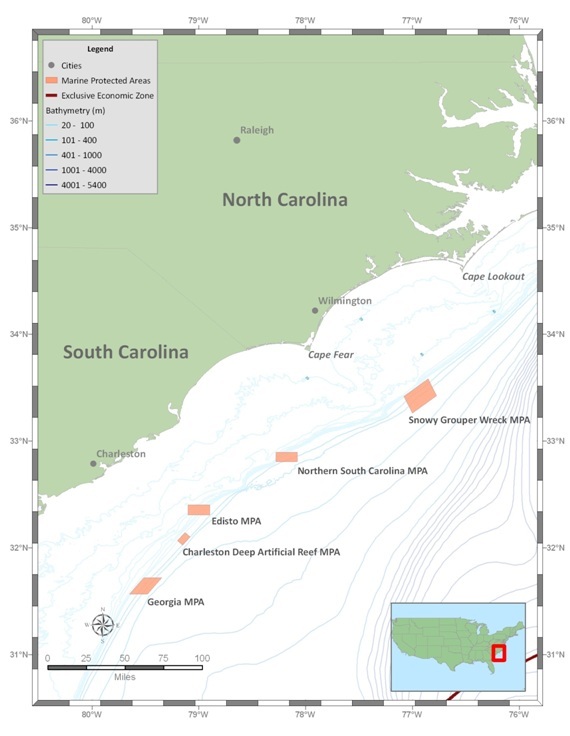 All commercial fishing in the Monument waters will be phased out by 2011, and oil and gas exploration and extraction is prohibited. Having been part of a research crew in the Monument for a week now, I appreciate all these efforts at conservation. There is little dry land surfacing out of the Pacific here, but the bird life and sea life are precious, including rare seals, sea turtles, and albatrosses. 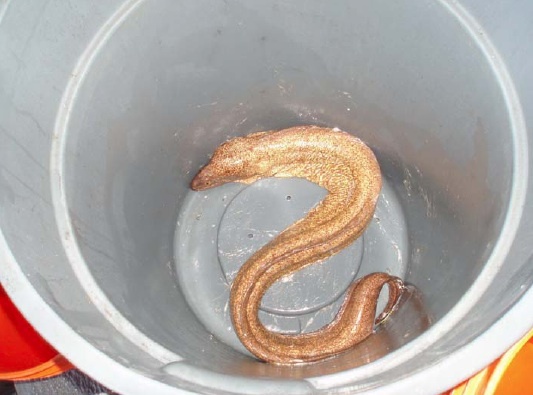 Watch out when there’s an eel in your trap! Most of the local species have sharp teeth, and are quick and eager to use them to gain their freedom. Working at sea makes me think often of the legacy of sailors before me. Though he was a global voyager, Captain James Cook’s influence is heavily felt in the Pacific. He honed his seamanship skills in the coasting collier (coal cargo) trade in Britain and honed his surveying skills in Canada, helping the British Navy fight the French. He charted the St. Lawrence River and the coast of Newfoundland, but was a surprise choice among his contemporaries for the Pacific voyages due to his lack of noble title and lack of Royal Navy training. His first command aboard Endeavour in 1768 was to observe the transit of Venus viewable from Tahiti. A replica of Endeavour now sails out of Australia, and for $1,000 Aussie you can too! The mission of Cook’s second voyage to the Pacific in 1772 was to “complete the discovery of the Southern Hemisphere.” He took command of Resolution and penetrated the Antarctic circle several times. Both Endeavour and Resolution were converted North Sea colliers, sturdy vessels familiar to Cook from his merchant marine experience. For the third voyage, Resolution also carried the latest equipment, including a Gregory Azimuth Compass, apparatus for distilling fresh water from seawater, and a new five inch marine chronometer, the K1, by Larcum Kendall. The chronometer provided for even better chart making as it was easier to use than lunar measurements and proved more accurate for finding longitude. In 1778, sailing to find a northwest passage between the Atlantic and Pacific, Cook encountered the Hawaiian Islands. Natives were friendly to the Captain and his crew, and when Resolution’s foremast cracked badly in February 1779, they returned to Kealakekua Bay on the big island of Hawaii to down rig the mast and float it to the beach for repairs. Misunderstandings developed as from both sides, resources were taken and tempers flared. When Cook went ashore with marines to seek settlement, a crowd gathered and became aggressive. Cook shot a Hawaiian, and in the retreat to the bay, Cook was clubbed and stabbed from behind, dying in the surf. Two other important figures were also witnesses that day in Kealakekua Bay. William Bligh of Bounty infamy was one of the ship’s officers, and Kamehameha, who unified the islands to become the first King of Hawaii, was nobility of the village ashore. Cook left quite a legacy of knowledge with his charts and logs, and a legacy of British influence around the globe. He accomplished surveys of the Pacific from Australia to Alaska. Resolution’s officers demanded Cook’s body be returned, but it came back as pieces of bone and flesh, which were buried at sea. There is a monument to Captain Cook in the form of an obelisk on Kealakekua Bay, and it’s curious to think that perhaps missing parts of his remains are buried there. Interestingly, that little part of Hawaii is technically British soil even to this day. Now, Kealakekua Bay is also a Marine Life Conservation District filled with coral, schools of tropical fish, and even spinner dolphins – another legacy this historic site can offer for the future.